Please check out my post for Sunny Day Crafting from earlier this morning here. Good morning everyone. It's my turn to post this month over at Silhouette Challenges. As always the challenge is Anything Goes as long as you use a Silhouette product in the creation of your project. For my post I created this Strawberry Shortcake treat box. So hop on over and link up today. And the perfect digi paper too! Another adorable treat bag! I just love Strawberry Shortcake! Very sweet treat box! 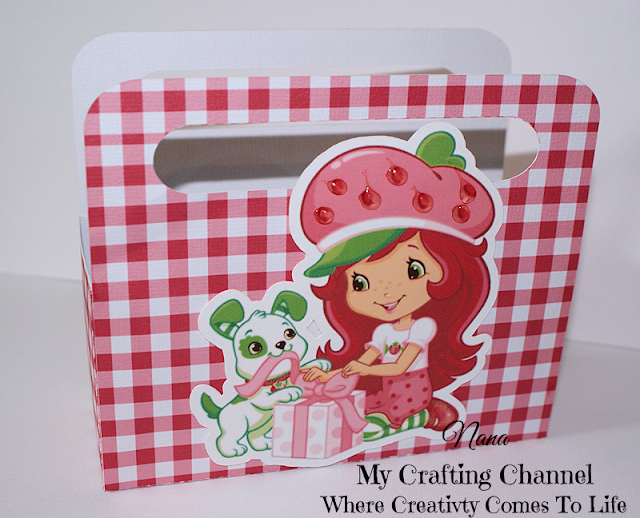 The gingham paper is perfect with Strawberry Shortcake! This birthday theme is going to be amazing with the Strawberry Shortcake goodies, I just love her! Hope you are having a wonderful Sunday! Wow. Too cute, Nana! I am loving how good the digi paper came out. I need a better printer. Such a sweet treat! !Love Strawberry Shortcake! Very pretty - love it! Fabulous! I love Strawberry Shortcake!